Eight-time Grammy award-winning crooner Usher is plotting his next move. He’s decided to list his Spanish themed contemporary home situated just a block off Hollywood’s Sunset Strip. This is approximately 1.5 miles from Justin Timberlake’s Condo, previously featured. Notably, he acquired the property a less than two years ago for a tidy sum of $3.3 million. At present, the 4,261 square-foot home is listed for $4.2 million. 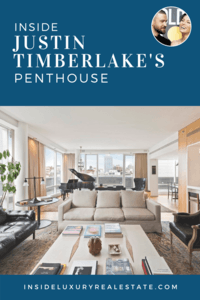 Known as one of the most successful pop stars with a net worth of more than $200 million, Justin Timberlake and his actress wife Jessica Biel has recently put their Soho penthouse on the market for $8 million. This beautiful 2,600-square foot penthouse in Soho, Los Angeles has been Justin Timberlake’s home since 2010, when he picked it up for $6.56 million.